Except for a short time when I considered becoming a doctor—actually, it was my pediatrician who prodded me to think about medical school, I just wanted to draw bones and muscles—I've planned to be a children's book illustrator since I was four years old. 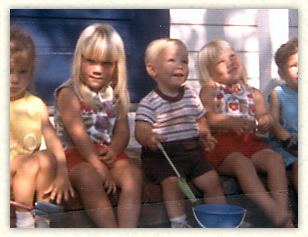 This is me at four (with the bangs) next to my brother, John, who is also an artist and my sister, Laura, who is a banker. My mother has always encouraged me. In fact, she told me the blank end pages on my set of Collier's The Young Folks' Shelf of Books were for me to draw on. She also taught me how to make a girl's face from a cracked egg, a princess gown from a triangle, and the side of a man's face out of capital "L"s.
My mother's first drawing lessons helped me see the spacial relationships between seemingly unrelated objects. I believe this helped me years later when I started drawing Hidden Pictures. Then, in the first grade I discovered Carolyn Haywood had both drawn and written B is for Betsy. Permanently inspired, I realized if I learned enough about writing and drawing stories, I might also be lucky enough to be allowed to do both jobs someday. As a teen I spent much of my time in the self-imposed study of anatomy. I had the ridiculous idea that Norman Rockwell "drew from his head," and my goal was to draw people as well as he did. I poured over anatomy textbooks, drawing bones and muscle groups. I have to admit my eventual disappointment in finding out that Rockwell used a projector and traced photographs onto his canvas. (I have since gotten over my prejudice, but had been scarred by years of elementary school friends falsely accusing me of "tracing.") I began to develop a less realistic style anyway, much thanks to my artistic mother whose constant critique that my figures were "too stiff" helped me move out of simple representational drawing and into a unique personal style. In the early 1990s, when computers were just becoming popular, I got a job illustrating educational software for Jostens Learning Corporation. Our group of young illustrators were among the first to use the computer as a tool for drawing. Now I use a Wacom stylus that looks and acts exactly like a pen, but in those days we sketched with a mouse and only had 16 colors to choose from. After working full-time as an illustrator and art director at various educational software companies, a book packager, and a computer game company, I took the freelance plunge, supplementing my meager trade book income with textbook and children's magazine work for clients such as PEARSON, STECK-VAUGHN, HEINMANN, OUP, MACMILLAN, HARCOURT, CARUS, HIGHLIGHTS, GIRL SCOUTS OF AMERICA and many others. The word "Tradigital" was probably coined in the mid 1990s by animated filmmakers to describe the emerging techniques as traditional illustrators got hold of computers. The idea of using a computer as a pencil is still not well understood by most people, even other traditional illustrators. Now I live in California with my teenaged daughter, two noisy African grey parrots, and an unruly border collie named Kip. I can see that you like animals too! My little brother is *obsessed* with them, so we have a zoo going on in our house! PS My daughter Dani is 20 now and just out on her own! I LOVE drawing! Like you, my fave thing to draw is people. I haven`t drawn adults nor kids over 10... I haven`t even drawn a baby!!! I think that wrinkles and muscles are the hardest to draw . but on the bright side, my mom`s amazing at sketches so she is a big help. If you haven`t noticed yet, I love art unlike most kids (you proboably also noted that I am a blabbermouth). I adore artists like you and want to be an artist/illustrator when I`m old enough. I just wanted to ask you what your favorite inanimate object to draw is. I try to think of inanimate objects as characters in their own right. Beautiful story of encouragment from your mother. When I was young, no one knew of my potential, though I drew, cut out paper dolls, wrote poems, and had a piece of art placed on the front cover of the school journal. I had no encouragement, that is until I became an adult and painted a small painting that struck everyone's interest, heart. In 1996 I began to paint and have learned a lot and I'm still learning. My heart loves your work and the support you received from your talented mother.